Here is a link to the video I made of my "woody beds". These beds are a bit of an experiment to see how one does compared to the other. And this last video is 2 weeks ago with a lot of the plants in and about 2 months of the beds being in place. Update to my bed. Since the fall, it's been completed with horse manure with dimensions of 50' x 5' x 3.5'. 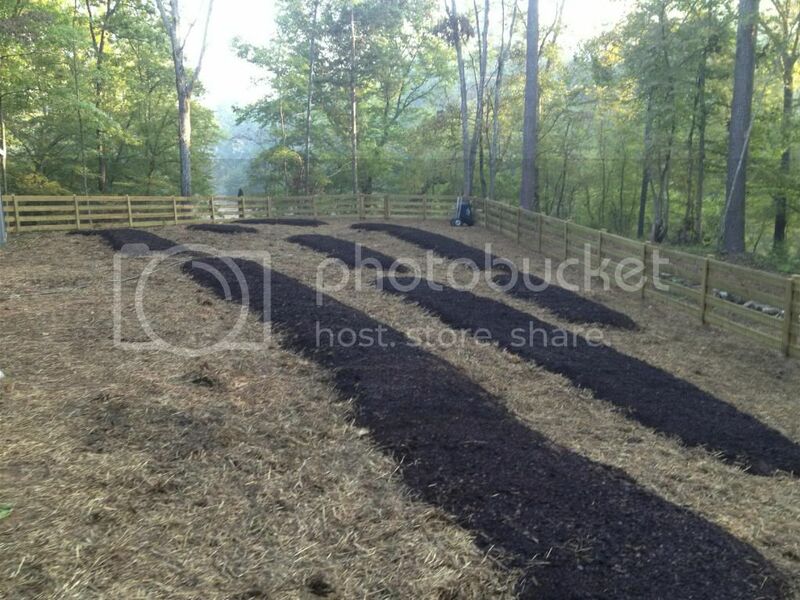 Mulched with straw, planted with starts and seeds, and fertilized when needed. List of plants: broccoli, brussels sprouts, cucumber, eggplant, dill, chamomile, onions, tomatos, peppers, rhubarb, sweet potatoes, pumpkins, squash, watermelon, and cantaloupe. Its a pretty big experiment this year to see what grows well and will tailor next year to that list. The rest will go in my other beds. So far, everything is growing good. Cucumbers and pumpkins are going crazy. I'm going to be attempting a smaller hugel bed down in the bottom of the garden. There are a couple old 3 foot by 5 foot beds laying side by side which I'll connect. I'll then be looking at about a 7 foot by 5 foot bed with the short side running down an incline. Got some rotting wood that I'll chop up and throw down. 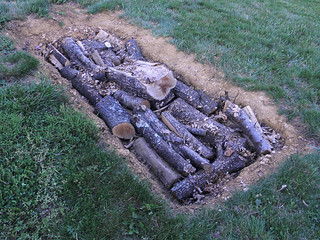 I'm going to do it above ground and just cover it with soil (from mulched grass and other waste). I'll then throw in some compost and slash some of the comfrey from one of the many plants we have in order to provide cover and nitrogen, instead of sowing a cover crop seed. I'll put up some pics once it's finished. Any ideas of what to plant in a smaller above-ground hugel bed? Anything that grows well in the coastal pacific northwest would probably be ideal. A question for y'all that have created these beds out of lawns. Do you have a problem with the grass creeping into the beds? My garden is cut from a corner of the lawn and I am constantly fighting the grass on the edges. I put down cardboard and pile on the dead leaves every fall, but by summer that stuff is rotted out (as it should be) and the grass comes back in force. I'm open to suggestions. I'm right there with you CopperKnight. I've dug out and planted flower beds and such over the last couple years with layers of weed cloth and such and the grass crawls right back in. It's really tough with this North Texas Bermuda grass. When I asked Jack about it at the workshop recently, his response was that the cover crops choked out and shaded the weeds but the Bermuda grass rhizomes really needed attention and to stay on top of it manually at least until the ecosystem got rolling. I wound up using Roundup and vinegar for about a foot around my raised beds and that at least let me get ahead of it until I could get cardboard and straw down. I still get grass finding a way to get through but it's very small amounts compared to what it used to be. The thicker the mulch, the stronger the grass has to be to get through it and it gets easier to see it and yank it out. Eventually it will get to a point where it will rot in the ground because the rest of the plants are using all the nutrients and sunlight. Considering how terrible my lawn looks, I'm not sure how the grass can have such a thick mat of roots. In the thickest parts I have resorted to pulling the mat out. My neighbor gave me some 4" plastic edging he pulled out of his yard. This actually seems to be working pretty well. It was a pain to get in, but if it holds it will be well worth it. 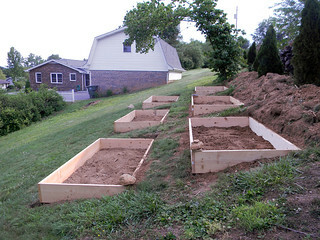 Here is the pics of our new "woody beds" on contour!!! It was so exciting to see this project finally come to fruition! We took a backyard from Georgia Red Clay to these beds which I hope produce an abundance for our family. Thanks to Jack and the TSP community for the motivation and knowledge. 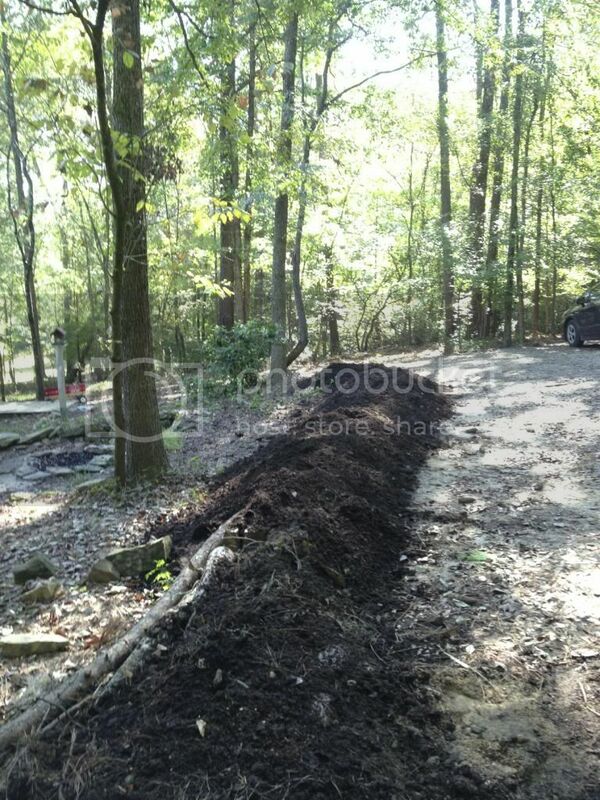 I put some pictures into my homesteading thread, I marked out the contour for the garden area and put the bottom bed into a hugle, I dug it roughly 2ft deep 4ft wide and 50 or so feet long, filled it with the wood I had laying around from trimming along the edges of my fields. I planned on doing all of the beds that way but after spending all day digging the one I didn't feel like doing the rest. I may expand do a second one this year. 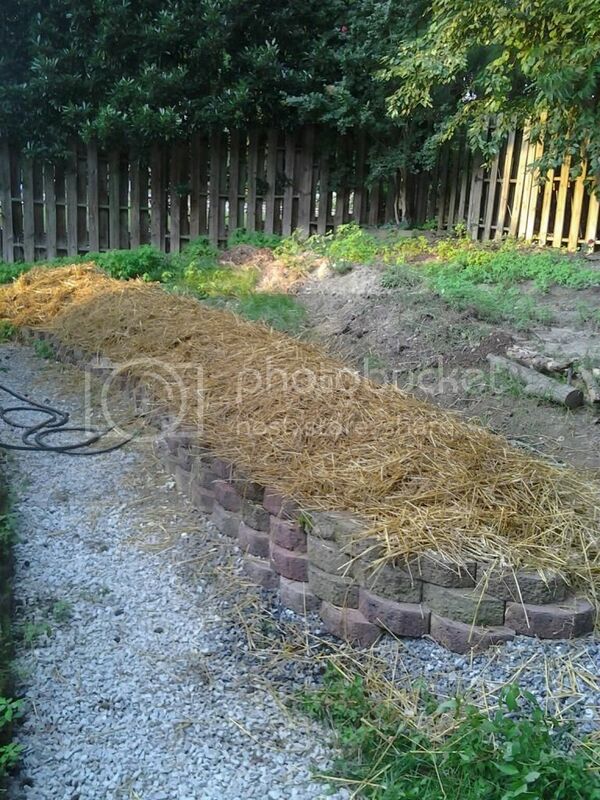 This is an update of my Woody Beds and a look at my 2013 garden. I put it on FB because youtube was not working for me today. so here is a link to my facebook page. Dang I hate google plus and face book. Cool video! Thanks for sharing! Last fall I took down our rotten old "water tower" at the cottage. 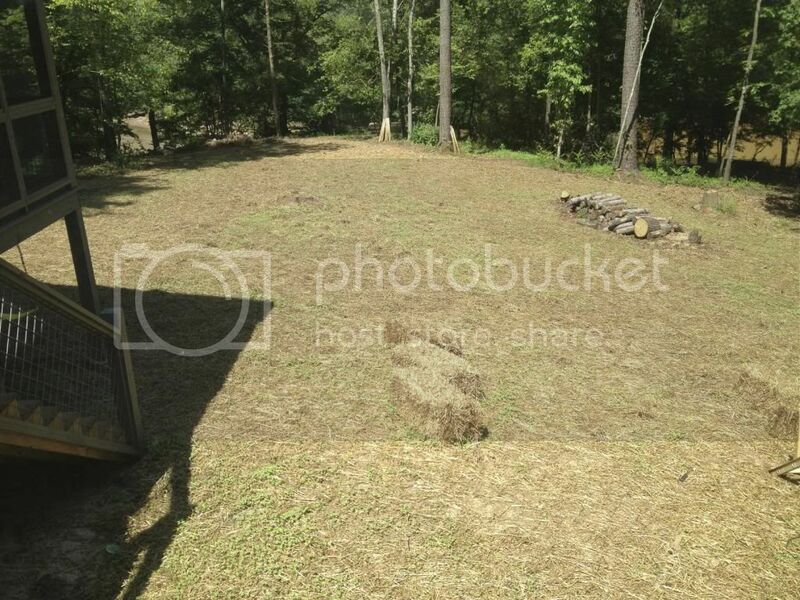 From a single stump over 4' across came three logs, each over 2 ft in diameter that 30 or so years ago had been cut off at about 15' tall and a platform built to hold a water tank . I think they were basswood and are so well rotted already that I was worried about the weight of the water tank bringing the whole thing down in to the cabin. I dragged them down near the ponds my father built. Not an easy task alone but I made it. It's very hard digging in this glacial till - so many potatoes(small round rocks) and roots- so I didn't get too deep before running out of steam. I got the left side of the bed covered with soil and enough trees cut out to get some sun in and still working on that but I'm far enough to at least get the soil warming up and get some seeds in. I'm hauling soil in to finish covering the right half of the bed. 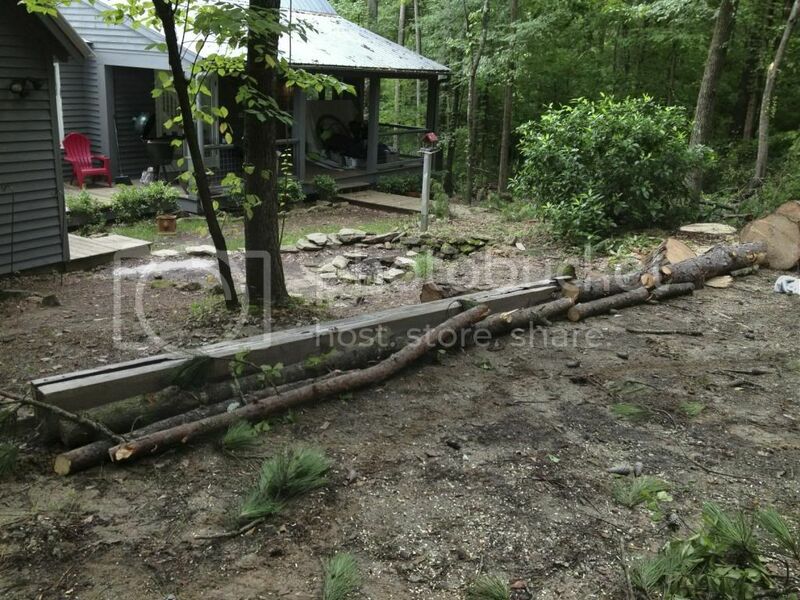 The 2 logs there are to hold the soil back, leaving enough room for ATV passage. I want to take all those cedars out (leaving some tall stumps in select locations) and use them to make a couple of terraces higher up on the slope and slow the water down, plus I can direct all the roof runoff into a 250 gal tote tank near the high side of all the future beds. I'll get some trees higher up, some shrubs in the middle elevations. Just behind the bed is a low spot that naturally collects leaves and debris - ready made compost pile.. Converting the back yard to a food forest using hugels. Here is a before (right) and after (left) shot of the area. About ready to put down some buckwheat to stave off the weeds until the fall planting. Trees on order. Here are my Raised-Not-So-Hugelkultur-Beds. I apologize to anyone who has been following the progress in my garden thread because I have previously posted the pictures there. Below is a picture taken at completion of the first dig. It basically gave me 6 semi-level spots to place the raised beds in my back yard. The land slopes top to bottom from between 17º to 30º and from left to right at about 10º. 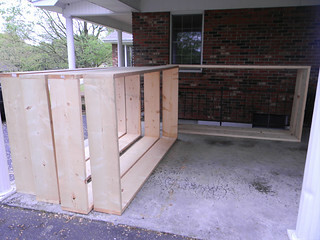 Here are the 4' x 8' boxes that I preassembled. Here is one of the stacks that I drew wood from. It's from an ornamental pear tree in our yard that had begun to suffer from center rot. It sat there drying for a couple of months. 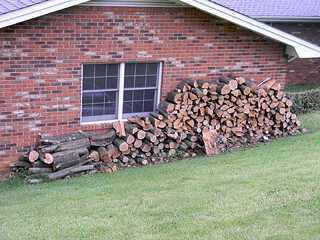 More wood came from the wood pile in our courtyard and was consisted mainly of maple. 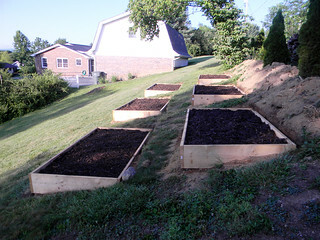 Here are the beds after the second dig and after being filled with wood, sod, leaves from last fall and fill dirt. 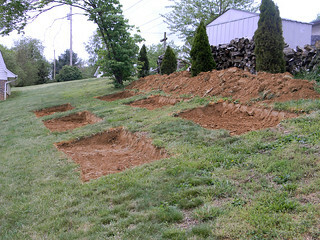 The second dig went about 2' down and left a shelf for the raised bed boxes to sit upon. This is a shot standing above the lower center bed. It's kind of hard to get an idea of what is going on due to the odd perspective. 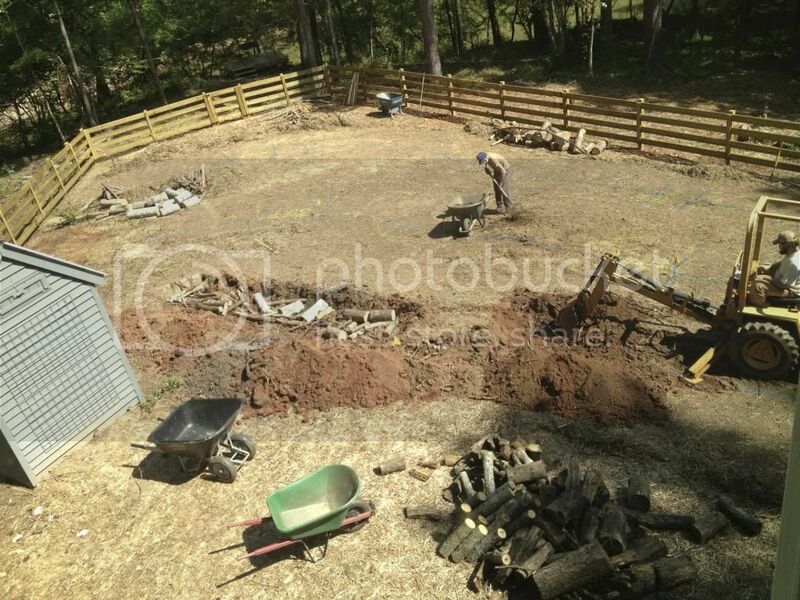 The beds after the frames have been set in, leveled and dirt was placed over the wood in the holes. The beds after being filled with compost and a cover of shredded mulch. 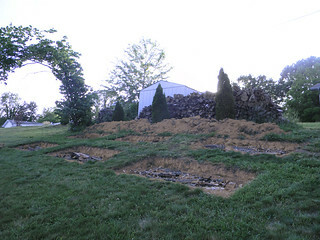 The mound of dirt you see at the top of the hill will be reduced in height and spread further along the boundary between the neighbor's yard and my own so that it can divert runoff from his garden which is upslope from mine. I was just planning on doing my rear slope like this. Glad to see I'm not the only one. Only difference is my slope is 2-3 times steeper, hopefully I can make it work by making deeper planter boxes. That's a rough incline to deal with. Keep us informed on how it goes. Whoo-hoo! Finally find a photo hosting service that would work with the podcast forum! As you can see, I've got the lower hugel sheetmulched, and I'm working on finishing the upper one this weekend. I'm planting buckwheat as a cover crop while I wait for the straw and cardboard to decompose a little, and then I'll be putting in my fall planting, definitely to include a variety of greens and so on. I've got trees on order from Starks, but they won't ship until November. Here it is with vegetation. There are 3 there, but the stump covers up one pretty well. I need to expand the spillway.